"Like the classic line about the aggrieved partner in a romantic relationship, the smaller donor star gave, and gave, and gave some more until it had nothing left to give," says Steve B. Howell, an astronomer with Wisconsin-Indiana-Yale-NOAO (WIYN) telescope and the National Optical Astronomy Observatory, Tucson, AZ. "Now the donor star has reached a dead end - it is far too massive to be considered a super-planet, its composition does not match known brown dwarfs, and it is far too low in mass to be a star. There's no true category for an object in such limbo." The binary system, known as EF Eridanus (abbreviated EF Eri), is located 300 light-years from Earth in the constellation Eridanus. EF Eri consists of a faint white dwarf star with about 60 percent of the mass of the Sun and the donor object of unknown type, which has an estimated bulk of only 1/20th of a solar mass. Howell and Thomas E. Harrison of New Mexico State University made high- precision infrared measurements of the binary star system using the spectrographic capabilities of the Near Infrared Imager (NIRI) on the Gemini North telescope and NIRSPEC on Keck II, both on Mauna Kea in Hawaii, in December 2002 and September 2003, respectively. Supporting observations were made with the 2.1-meter telescope at Kitt Peak National Observatory near Tucson in September 2002. EF Eri is a type of binary star system known as magnetic cataclysmic variables. This class of systems may produce many more of these 'dead' objects than scientists have realized, says Harrison, co-author of a paper on the discovery to be published in the October 20 issue of the Astrophysical Journal. "These types of systems are not generally accounted for within the usual census figures of star systems in a typical galaxy," Harrison says. "They certainly should be considered more carefully." The white dwarf in EF Eri is a compressed, burnt-out remnant of a solar-type star that is now about the same diameter as the Earth, though it still emits copious amounts of visible light. Howell and Harrison observed EF Eri in the infrared because infrared light from the pair is naturally dominated by heat and longer wavelength emissions from the secondary object. The scientific detective work to deduce the components of this binary system was complicated greatly by the cyclotron radiation emitted as free electrons spiral down the powerful magnetic field lines of the white dwarf. The white dwarf's magnetic field is about 14 million times as powerful as the Sun's. The resulting cyclotron radiation is emitted primarily in the infrared part of the spectrum. "In our initial spectroscopy of EF Eri, we noted that some parts of the infrared continuum light became about 2-3 times brighter for a time period, then went away. This brightening repeated every orbit, and thus had to have an origin within the binary," Howell explains. "We first thought the brightness change resulted from the difference between a heated side and a cooler side of the donor object, but further observations with Gemini and Keck instead pointed to cyclotron radiation. We 'see' this additional infrared component at the phases which occur when the radiation is beamed in our direction, and we do not see it when the beaming points in other directions." The 81-minute orbital period of the two objects was probably four or five hours when the mass transfer process began about five billion years ago. Originally, the secondary object may also have been similar in size to the Sun, with perhaps 50-100 percent of a solar mass. "When this interactive process of mass transfer from the secondary star to the white dwarf begin, and why it stopped, both remain unknown to us," Howell says. During this process, repeated outbursts and novae explosions were very likely. The physics of the process also caused the two objects to spiral closer to each other. Today, the two objects orbit each other at about the same separation as the distance from the Earth to the Moon. The donor object has regressed to a body with a diameter roughly equal to the planet Jupiter. The combined observing power of the Gemini 8-meter and Keck 10-meter telescopes and their large primary mirrors, which were essential to this research, Howell says, makes it clear that neither spectral features of the donor nor its composition match any known type of brown dwarf or planet. Derek Homeier (University of Georgia) created a series of computer models that attempt to replicate the conditions at EF Eri, but even the best of these do not match perfectly. The shape of the spectra indicate a very cool object (about 1,700 degrees Kelvin, equivalent to a cool brown dwarf), yet they do not have the same detailed shape or key features of brown dwarf spectra. 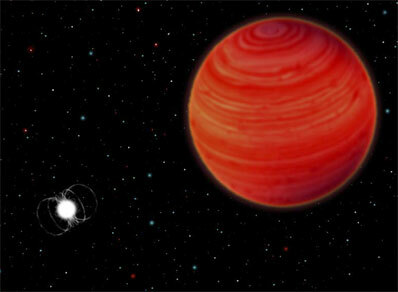 The coolest normal stars (very low mass M-type stars) are about 2,500 degrees K, and Jupiter is 124 degrees K. The close-in "hot Jupiter" exoplanets detected indirectly by other astronomers using their gravitational effect on their parent stars are estimated to be 1,000-1,600 degrees K.
There is a small chance that the EF Eri system could have originally consisted of the progenitor of the present-day white dwarf star and some sort of "super -planet" that survived the evolution of the white dwarf to result in the system observed now, but this is considered unlikely. "There are about 15 other known binary systems out there that may be similar to EF Eri, but none has been studied enough to tell," Howell says. "We are working on some of them right now, and trying to improve our models to better match the infrared spectra." Co-authors of this paper on EF Eri are Paula Szkody of the University of Washington in Seattle, and Joni Johnson and Heather Osborne of New Mexico State. The WIYN 3.5-meter telescope is located at Kitt Peak National Observatory, 55 miles southwest of Tucson, AZ. Kitt Peak National Observatory is part of the National Optical Astronomy Observatory, which is operated by the Association of Universities for Research in Astronomy (AURA), Inc., under a cooperative agreement with the National Science Foundation (NSF). The national research agencies that form the Gemini Observatory partnership include: the US National Science Foundation (NSF), the UK Particle Physics and Astronomy Research Council (PPARC), the Canadian National Research Council (NRC), the Chilean Comision Nacional de Investigacion Cientifica y Tecnologica (CONICYT), the Australian Research Council (ARC), the Argentinean Consejo Nacional de Investigaciones Cient�ficas y T�cnicas (CONICET) and the Brazilian Conselho Nacional de Desenvolvimento Cient�fico e Tecnologico (CNPq). The Observatory is managed by AURA under a cooperative agreement with the NSF. The W.M. Keck Observatory is operated by the California Association for Research in Astronomy (CARA), a scientific partnership of the California Institute of Technology, the University of California, and the National Aeronautics and Space Administration.